Gas heating is generally trouble free and convenient. However gas furnaces are machines and do require annual maintenance to remain trouble free and operating efficiently. R Fulton Improvements can help. Without a yearly cleaning and inspection by R Fulton Improvements, a gas furnace can fall into disrepair and may suddenly stop working, probably on a frigid winter morning when your family needs it most. Worse yet, clogs or leaks in the furnace exhaust system could vent deadly carbon monoxide into your home. For this reason, any home with gas heat should have a carbon monoxide detector installed in addition to smoke detectors. 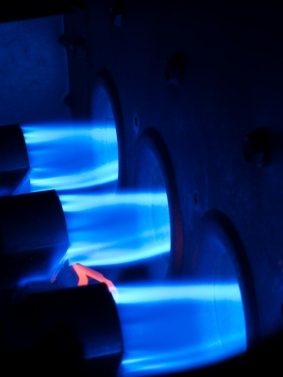 Inspecting the burner – Flames from your gas burner should be blue. Otherwise, the burners will be cleaned. If the flame size is not correct, then the burner will be adjusted. Cleaning the burner – Fire makes soot. Over time soot build up can impact the efficiency of your gas furnace. R Fulton Improvements vacuums the soot to remove it, leaving your gas burner clean and efficient. Cleaning the blower – Bits of dust stick to the blower reducing efficiency and eventually unbalancing the motor. R Fulton Improvements technicians carefully and thoroughly clean each blade of the blower using special brushes and a vacuum. Changing the air filter – The air filter on your gas furnace removes dust and pollen from the air before it is blown throughout your home. Over time, air filters become clogged, which makes your furnace work harder to move air, thereby decreasing efficiency. As part of every cleaning, R Fulton Improvements replaces your gas furnace's air filter. Clean the igniter – Your furnace has either a pilot light, electronic igniter, or hot surface igniter. This component is responsible for ensuring that gas is burned before it escapes into your home. R Fulton Improvements inspects and cleans igniters to ensure your gas furnace operates properly and safely. Clean the flame sensor – The flame sensor has the important job of shutting off your gas furnace if there is no flame when there should be. However soot on this sensor can cause the furnace to turn off even when the everything else is working properly. To ensure trouble free operation, R Fulton Improvements gas furnace technicians clean the flame sensor. Inspecting and cleaning the flue pipe – Over time soot also builds up on flue pipe walls, restricting exhaust flow and corroding the metal. Without cleaning, soot will combine with moisture to create acids that create holes in your flue pipe allowing exhaust gases, including carbon monoxide, to vent into your home. Proper flue pipe inspection by R Fulton Improvements checks for leaks in your flue pipe to keep your family safe. Keep your gas furnace safe, efficient, and trouble-free with professional gas furnace care by R Fulton Improvements. Serving homes and businesses over 20 years.